Do you feel uncomfortable looking at Honeycomb, Enlarged pores of the skin, Bubbles in Dough, Ant holes, Clusters of holes? You might be suffering from this phobia which is a fear of holes. This strange phobia named Trypophobia was defined 12 years ago, and after that many people have since come forward who are suffering from this phobia. Now before we tell you what is Trypophobia or fear of holes, its symptoms, causes or treatments, let us first see what is Phobia? The word derives its meaning from the Greek word (Phobos) meaning aversion or fear. A Phobia is an irrational fear of an object or situation. It generally results from the onset of fear and is present for more than 6 months. The fear is so much that the person goes to extreme lengths to avoid it sometimes even risking their own life. Specific phobias – certain objects or situation that arises fear in the person. Example fear of heights, fear of holes, cats etc. Social phobia – the person has fear of social situations and tries to avoid it in any way they could. People judging them is their worst nightmare. The idea of large social gathering is terrifying for them. Agoraphobia – the person fears that they might not be able to escape from a particular situation. It can happen both in confined and open places. They are at the higher risk of having a panic disorder. Fear of avoiding the object or situation at any costs. Phobias are diagnosable mental disorders. It prevents them to function normally and may even lead to panic attacks. Individuals are aware that their fear is irrational but they cannot control the fear reaction. According to the statistics people affected by phobias are around 6-8% in the world. Women are affected twice as more often than men. Typical onset begins from around 10 to 17 years of age. Older people are in the lesser risk of developing one. People who have phobias are at the high risk of suicide. Some fears are learned from the environment around us. Example: fear for touching a wire after we have learned that we might get shocked. Some by observing others i.e. if a child sees that the parent is afraid of a particular animal, then they also start to develop fear from that particular being. Researchers have linked it to the Amygdala, which lied behind the pituitary gland in the brain. The amygdala triggers the fight or flight hormones. They put the body and the mind in a highly alert and stressed state. Systematic desensitization – It was introduced by Wolpe, a technique for treating phobias or irrational fear. The client is interviewed to elicit fear-provoking situations and then asked to think about the least anxiety- provoking the situation. After a certain time, they move up in the hierarchy. And then over the course of time, the person manages to maintain relaxation along with thinking about the situations. Cognitive Behavioral Therapy – It has been one of the most effective therapy in dealing with phobias in children and adolescents. The events which cause distress are noted. The irrational beliefs that people hold onto are challenged. Gradually the person tries to get the sense that the fears or beliefs are irrational are must be excluded from their mind. Thus, there is a reduction in psychological distress. Medications – They can help in regulating fear of a particular object or situation. Sedatives like benzodiazepines help in regulating the anxiety they feel. Antidepressants like SSRIs act on serotonin, a neurotransmitter in the brain that impacts mood to a great extent. A study in Psychological Science suggested about 15% of the population might Have Trypophobia, a fear from irregular patterns or clusters of small holes, in simple words fear of holes. The term was coined by internet users in 2005 according to the sources. Researchers believe that our genes have a certain notion when they see holes or clusters and that is a danger. Maybe that is the reason some people fear that. It is still termed as a mental disorder but if the fear is seen as persistent and causing distress then it comes under the category of Specific phobia. It depends on how the person is responding to it. Before the term was coined no one really came forward to admit that they fear holes or clusters. But ever since it has become popular on social media people are accepting that they might be diagnosed with trypophobia (fear of holes). It is also observed that you might not like the sight of it but there is other distress reported. Trypophobia often comes with an autonomic nervous system response. Beehives, bubbles, sponges, holes on strawberries, coral, pomegranates, condensation, spotted skin on insects, mammals etc, when seen by people, may cause discomfort at first. They even experience nausea, itchy, goosebumps, disgusted at the sight of it or worse a panic attack. It can also result in serious migraines to hot sweats and increased heartbeat. Excessive fear seeing that thinking it might harm them. There are certain sensations that people experience in their bodies has also been noted. Wilkins and Cole have tried studying Trypophobia. they said it is “unusual but common “. The title of their paper was “Fear of Holes”. What they make out is that trypophobic images have rather a strong similarity with certain animals. The animals we think are dangerous for us so seeing the sight similar to the alerts/warns our brain. Yamada and Sasaki propose that the reactions people give are because of the association with skin diseases. A Chinese study evaluated whether the symptoms of Trypophobia are present in preschool children and their discomfort was based on the visual stimuli specifically. It was said that the discomfort was mostly because of the cluster pattern itself. Professor Matthews gave another theory stating that people fear those images because of priming and conditioning. Though some researchers even question the validity of Trypophobia as a phobia. A study from 2017 shows a link between Trypophobia, Major Depressive Disorder, and Generalized Anxiety Disorder. According to the research people with Trypophobia are more likely to experience the other two. When people see images it makes them feel uncomfortable that leads to an unpleasant situation which in turns creates anxiety to them that could possibly go to depression thinking something is wrong with them. Another study in 2016 reveals a link between social anxiety and trypophobia (fear of holes). If you ever feel that you are affected by a certain phobia, see a doctor. The doctor will ask certain questions regarding the symptoms that make you think you have one. The person’s case history is taken very well that includes a previous medical condition. It is still not officially recognized as a disorder so it might take time to get diagnosed with one. Exposure therapy which is used to treat phobias, is likely to be effective for treating Trypophobia. The person is exposed to the certain shape for a long time until they become accustomed to that. It is done without any intention to cause danger. Cognitive behavior therapy can again replace irrational thought patterns. Medications such as sedatives, tranquilizers to reduce anxiety. Counseling, talking about their fear and spilling all the beans on the table helps the person to relax. Relaxation techniques like meditation and yoga. Hypnosis has been used time an again to get rid of irrational fears like fear of holes. Other than this there are no other specific treatments till now. Changing the lifestyle can create a great impact. Monitoring sleep patterns, eating nutritious food and avoidance of any drugs and stimulants. To conclude the above-written points. A phobia is a type of anxiety disorder that causes an individual to experience extreme fear from a certain object, situation or place. That has three categories specific, social and agoraphobia. 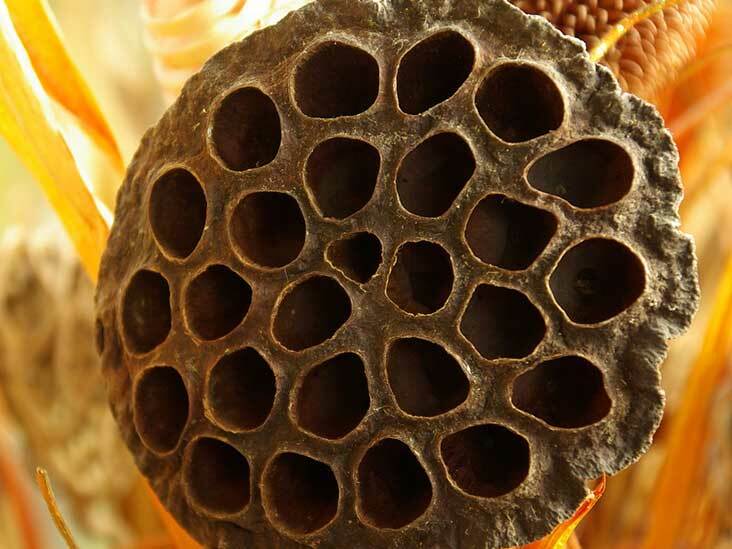 Under specific phobia come the Trypophobia that is basically fear from holes. An irrational fear that is yet to be official in the manual for disorders. Some researchers validate its existence while others say it comes from our genes or has an evolutionary basis. The person experiences great heights of fear which leads to other conditions of phobia. Fear can be literally from anything but not everything can be termed as a phobia. Unless and until that certain fear doesn’t hamper with your daily routine or is causing distress it cannot be termed as one. I fear dogs but naming it as a phobia is not correct. I’m certainly afraid that it’s not a stressor for me. Anything that scares you has the power to control you and only you can give or take that power. CBT provides you that knowledge to introspect whether your fear is based on some irrational or irrelevant stand. Overcome them before taking it on you. When you explore your fears then you set yourself free!